You are browsing the archive for November 2008. The Cadillac dealership near me is having a huge sale on Escalades. They’re like driving your living room around (if you have a large comfortable living room with a lazy boy and every electronic device you need within reach). 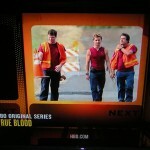 This week on True Blood: The gang learns you can kill a vampire by driving a wooden traffic cone through its heart. As a past contributor, I received a mailing from the fine organization Doctors Without Borders, which included a free world map: There was only problem: There are borders ALL OVER THIS MAP! I just don’t know who to trust anymore.